UHV President Vic Morgan and jaX get ready to compete in the Nov. 3 Over the Edge fundraiser event during which they will rappel down One O'Connor Plaza in downtown Victoria. What happens when a Nov. 3 fundraising event allows the University of Houston-Victoria’s mascot and ambitious university president to raise money to rappel down a 12-story office building? A good old-fashioned competition begins. 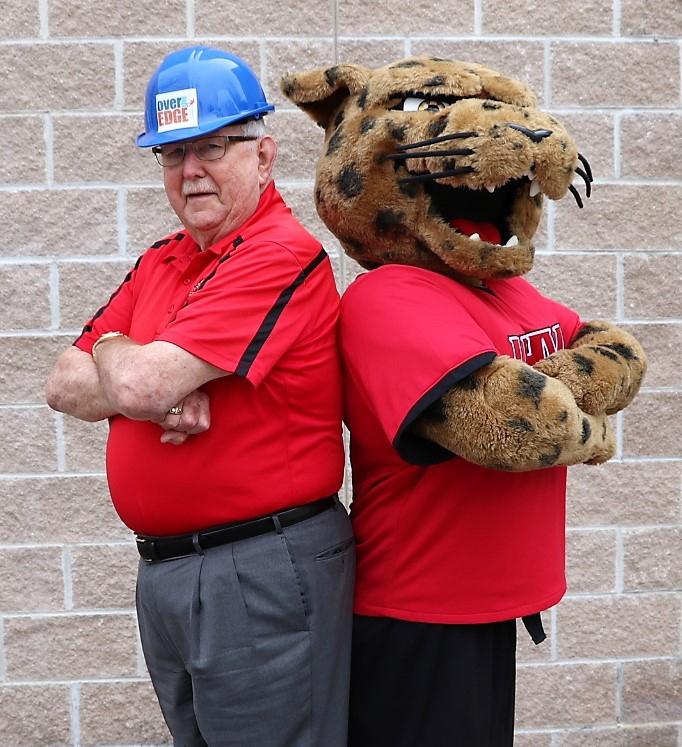 UHV President Vic Morgan is competing against UHV’s jaguar mascot, jaX, in the Over the Edge event to be the first to raise $1,000. Whoever wins will get to rappel down the 12-story downtown office building, One O’Connor Plaza, ahead of the other. Funds raised will benefit three Victoria nonprofit organizations: the Hispanic Council of Victoria, Challenged Athletes Dream Complex, and Victoria Business and Education Coalition. The university’s participation in the fundraiser has sparked a friendly competition between two familiar faces seen throughout campus, and the students, faculty and staff are encouraged to participate by donating to the cause and cheering for their university favorites. As the UHV mascot, jaX has had the privilege of working with Dr. Morgan and often participates in community fundraisers such as Over the Edge, Wilkinson said. This fundraiser is a competition that jaX wants to win to show the community the spirit of #JAXNATION. Over the Edge supports three local nonprofit organizations. The Hispanic Council of Victoria helps promote leadership and supports the economic development, growth and education of the Victoria County Hispanic community. Challenged Athletes Dream Complex earns funds to be able to partner with the City of Victoria to build a new integrated playground where children without physical and mental challenges can play with children who do have these challenges. The Victoria Business and Education Coalition increases support for Victoria youth through mentoring, character building activities, job readiness training and career exploration. Members of the three nonprofits benefiting from the event have expressed gratitude toward the event participants. Lanell Mantey, executive director of VBEC, knows firsthand what it’s like to see community leaders like the ones at UHV participating in a cause that will benefit her group. Supporters can choose to participate in the event by attending Over the Edge to watch those who will rappel down the building, donating or raising at least $1,000 and rappelling down themselves. To donate to President Morgan visit https://otecwe.com/victoria/vic-morgan/ or visit https://otecwe.com/victoria/jax-the-jaguar/ to donate to jaX.